Karl-Heinz Kohl is director of the Frobenius-Institute, professor emeritus at the Goethe-University Frankfurt a. M., Germany, and a member of the Berlin-Brandenburg Academy of Sciences. He received his M.A. and his Ph.D. in comparative religion from the Free University, Berlin. Kohl was professor of Social and Cultural Anthropology at the Johannes-Gutenberg-University Mainz and at the New School for Social Research, New York. 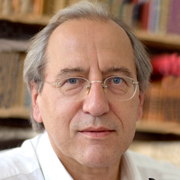 From 2007 to 2011 he served as chairperson of the German Anthropological Association. He spent several periods of ethnographic fieldwork in East Indonesia, New Guinea and Nigeria. His research focusses on anthropology of religion and the history of anthropology. Among his most recent publications is „The End of Anthropology?“ (co-ed. 2012). An English translation of his monograph „The Power of Things. History and Theory of Sacred Objects“ will appear in 2015.